The boss of one of the UK’s leading presswork specialists is urging his fellow manufacturers to take a closer look at their utility costs after his firm saved £10,000 in just two months. 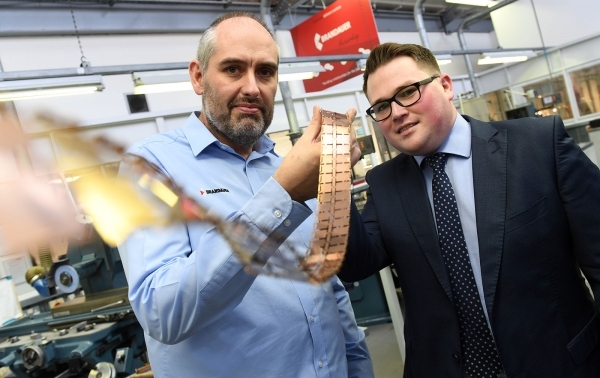 Rowan Crozier, CEO of Birmingham-based Brandauer, believes it is a hidden cost that can quite easily be eradicated if the right expertise is sought and if companies aren’t afraid to ask questions. His firm tapped into the expertise of Control Energy Costs (CEC), a specialist in utility management, procurement and support services, to explore the process and was amazed how quickly they were able to identify pricing issues, incorrect billing and opportunities for smarter energy management. This led to over £10,000 of savings within a few months of the relationship starting, with the option to save thousands more when the supply contracts are up for renewal. “We manufacture millions of components for the automotive, domestic goods, electronics, plumbing and renewable sectors every week so you can see how energy is a massive overhead for us…the fact costs are rising all the time can really impact on our ability to compete globally,” explained Rowan. CEC work with more than 450 manufacturers across the UK every year, providing companies with a full utility management, procurement and site works service covering electricity, gas, water and associated costs. Its team of analysts provide an initial, no-obligation audit and then work with the customer to identify existing issues and opportunities to reduce bills or secure better supply contracts. Unlike energy brokers, the company earns its fees by taking a share of the savings based on the results it achieves. Mark Stephenson, Analyst for CEC, is leading on the Brandauer contract: “The nature of its business is energy intensive so there are lots of ways we can work with the management team so they are getting the most out of their utility costs. Rowan concluded: “If we’d have realised how easy the process was we’d have done it ages ago. Manufacturers are always moaning about rising costs, this is one way of negating some of them.